When I was a child, I learned how to print using #2 pencils and children’s lined writing paper. It felt natural to me to put the pencil in my left hand, resulting in “hooked” writing and pencil lead smeared on the end of my palm and little finger. My teacher tried to persuade me to write with my right hand. She attempted to show me how by holding the pencil and guiding my hand. It felt awful. Horrible. Unnatural. Wrong, even. I refused and told her I needed to write with my left hand. I went home and told my parents about it, and they strongly supported my decision, knowing that I was left handed, just like my dad. I’ve written all my life with pencil and ink smears on my left hand. I’d be lying if I said it didn’t bother me, although I wouldn’t change it. I just wash my hands when I’m done. It’s a part of my life as a professional freelance writer. Another part of my life as a professional freelance writer is the tradition my husband has started at Christmas of stuffing my stocking with a pack of pens. I look forward to the pens every year. This past Christmas, my husband hit the mother load and may have solved my left handed ink smearing woes forever. For Christmas 2014, stuffed in my stocking were a dozen Zebra Sarasa Rapid Dry Ink gel pens in black. 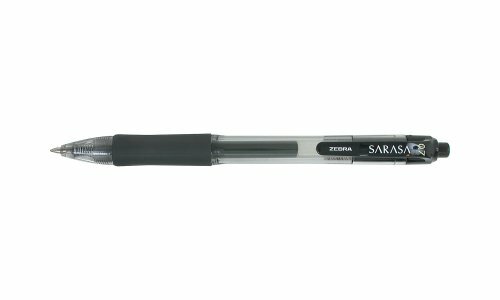 Sarasa is one of my favorite pen brands. But the Rapid Dry Ink pens are “ideal for the left handed,” and let me tell you, they live up to that claim. I LOVE them. I may never buy another type of pen ever again. I don’t have any ink on my hand once I’m done writing. It’s amazing. I didn’t think it was possible. Writing by hand has never been more enjoyable. The Amazon link is not an affiliate link. I am simply so excited about these pens and wanted to share them with you. These pens would be great for right handed writers as well, as the ink is smooth and really does dry in less than a second on paper. For left handed writers, however, these pens are a boon. My only regret is not discovering them sooner, and I’m so grateful my husband saw them and knew how much I’d like writing with such a pen. What’s your favorite writing instrument?